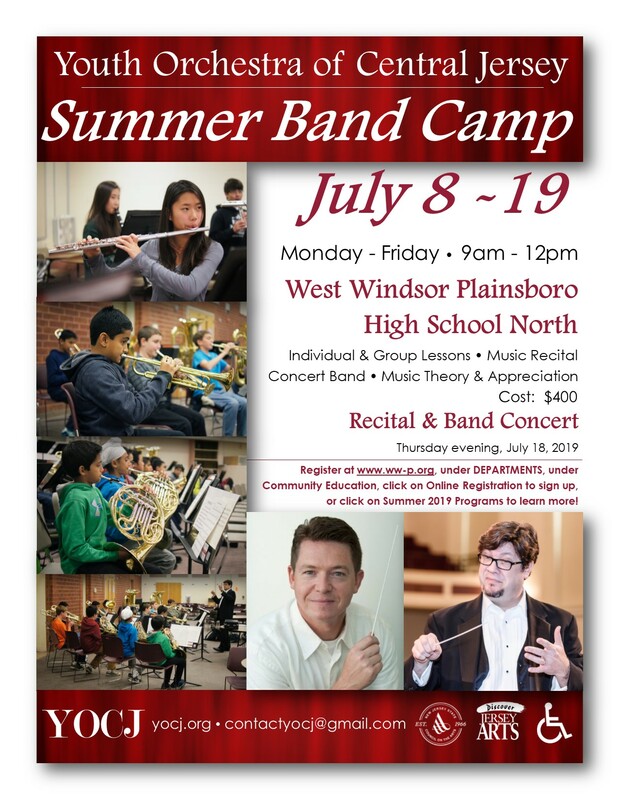 YOCJ is pleased to announce that we will be running a Summer 2019 Band Camp for students in 6th-9th grade! Please read below for details! *Students entering grades 6-9 must have a minimum of one school year experience playing one of the following traditional band instruments: flute, oboe, bassoon, clarinet, bass clarinet, alto saxophone, tenor saxophone, baritone saxophone, french horn, trumpet, trombone, euphonium or baritone, tuba, percussion. *Wind and brass players must provide their own instrument, reeds, oils, and all accessories for playing. Percussion players must provide their own mallets, sticks, and stick bag. *Beginner instruction will not be provided. *Music folders, stands, chairs, and percussion instruments will be provided. *Baritone saxophone and tuba will be provided to students playing those instruments on a first come, first served basis. For more information about YOCJ, please visit www.yocj.org.